19 Oz Bottle of our Bar-B-Que Sauce available in four different flavors, Mild, Hot, Hottest and Vegan. Our individual bottles require a minimum of 2 Bottles per order, but please order as many as you like. Quantity pricing starts at 3 bottles @ $5.00 per bottle, a Savings of $1.00 per bottle! Bulk pricing starts at 12 bottles (Case Pricing) @ $4.75 per bottle, a Savings of $1.25 per bottle! Pricing is automatically calculated when you add the item to your cart based on the number of items you purchase. You can change the quantities and add or remove items from the Shopping Cart before/during Checkout. 19 Oz Bottle of our Chicken Marinade. Bulk pricing starts at 12 bottles (Case Pricing) @ $4.75 per jar, a Savings of $1.25 per bottle! 19 Oz Bottle of our Marinade Game Sauce. 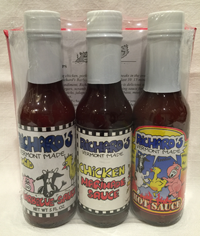 Our Hot Sauce Barnyard Label available in a 5 Oz bottle. 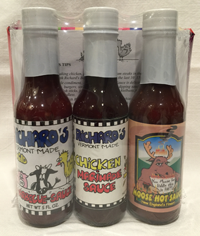 Our Hot Sauce Moose Label available in a 5 Oz bottle.